OneSearch is an online research tool that “pulls together” almost all of our Library resources so that they can be explored using a single search box. 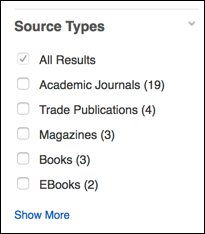 In other words, rather than searching the Library Catalog for books and a database such as Academic Search Complete for journal articles, you can do a OneSearch search and get results which include books, e-books, journal articles, and government documents in one list. 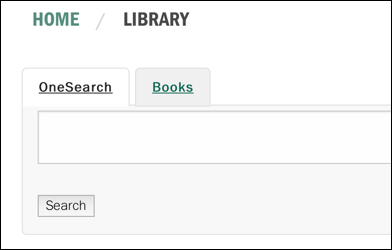 On the library homepage, enter your search terms in the search box. Click on Search. The default search is for OneSearch. You can search just for books by clicking on the Books tab. If you want to search for a phrase, enclose your words in "quotation marks". OneSearch initially displays titles of sources, authors, and subjects. Hopefully, this will provide you with enough information to decide whether you want to see more. 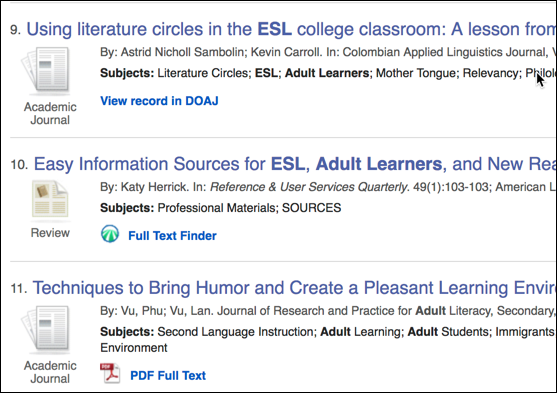 If an item is available in full text in one of the EBSCO databases, you will see an HTML or PDF full text link. Many of the HTML full text results will include tools to listen to the text (using automated speech-to-text) or to translate it (using machine translation).